The 10-day hands-on culinary program will include daily cooking classes, discussions and activities, as well as excursions and time around the unbelievable nature at the Dalabelos Estate agritourism complex fashioned from local stone that boasts scenic views of surrounding Cretan landscapes. For those unfamiliar, the Dalebelos Estate is situated in a pristine Cretan landscape in the heart of Rethymno Prefecture at the foot of Mt. Ida. I’ve reported on the touristic value owner Vassilis Petrodaskalakis provides before. So, it’s good news to find out culinary tourism events such as the one featuring Dr. Christopher Bakken are picking up. The estate features an interesting mix of traditional rural Crete in combination with a wonderful infinity pool, hot tubs, full-service restaurant, traditional music, and cultural programs. The program will run from June 1-10, 2019, with activities taking place in a working vineyard, olive grove and organic farm not far outside Rethymno, Crete. Classes will feature lessons in wild-yeast sourdough bread, traditional phyllo, wood-oven cooking, wild greens, as well as wine, olive oil, and honey tastings. Bakken, agritourism expert and musician Vassilis Petrodaskalakis and Dalabelos Executive Chef Maria Boulougouri will instruct students. 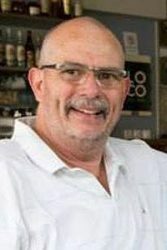 With nearly 3 decades experience cooking, writing and traveling throughout Greece, Christopher Bakken is the author of the culinary memoir, Honey, Olives, Octopus: Adventures at the Greek Table, as well as three books of poetry. Readers who want more information about the program are encouraged to visit Dr. Bakken’s website here.